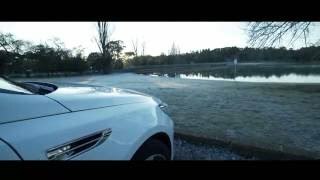 If you have been following the ‘Kia trend’ since a while, you might have had desire to see a fully grown sports car from the Optima people. Well I believe the wait is over finally, as company took the curtains off its all new Kia Optima GT 2016. Bolder design, better comfort and lots of power, is what company has to talk about this new release. 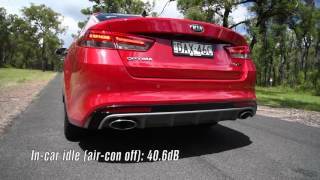 Let us have a look at the review of Kia Optima GT 2016 to know more about it. In terms of Interior details of Kia Optima GT 2016, company without being specific narrated a lot. Kia officials at the Frankfurt Motor Show shared that the model will have same looks and features that we have seen in the recent times. This for me in particular brings the only bad news of having Black upholstery as option while the better side highlights to me marvelous and multi-purpose user friendly infotainment system featuring navigation and supporting voice commands and also the stunning panoramic sunroof that will allow little fresh air to serene the cabin. For more detailed information we’ll have to wait a bit more, as the interior of Kia Optima GT 2016 still owes the first look to its buyers. The exterior of Kia Optima GT 2016 is quite a different from the regular Optima, as expected. I won’t call it as complete overhaul but there are certain amalgamations which make this model stand ahead in the list. Starting with the front fascia, the major change comes with the massive air vents replacing fog lamps. The inclusion gives the model a ferocious touch. Moving towards the rear you’ll notice new set of wheels mounted which turn to be another change setting this model apart. 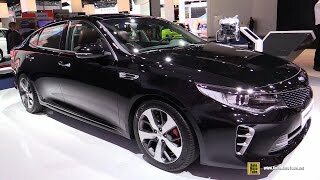 The bigger wheels also add to aggressive look while the rest of the exterior details of Kia Optima GT 2016 are somewhere holding resemblance to the Optima SX Turbo. Thus the model features aggression, sportiness and luxurious looks. 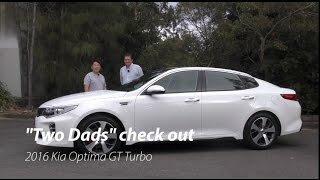 Beneath the hood of Kia Optima GT 2016 is a 2.0 liter four-cylinder turbocharged engine throbbing total output of 241 hp and peak torque of 353 nm. 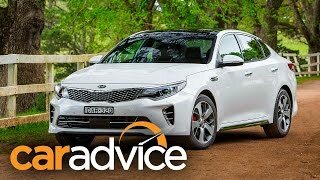 The power rolls the massive 18 inch wheels and thus can take the top speed of Kia Optima GT 2016 to 149 mph while the 0-62 mph sprint can be knocked in 7.4 seconds.